I made a big batch of recipes to post on the blog a couple of weeks ago and have been dying to share this one with you. It's one of my favourites at the moment and while it's light enough for the hot weather, its still totally nourishing and delicious. I really do love noodle soup! It is so simple to make and you can get really creative with it. This is a great dish to whip up when you are short of time, but still looking for a satisfying meal and it certainly isn't short of flavour. The ginger in this version really makes this dish, pulling together all the wonderful flavours and creating a fresh, warming bowl perfect for any season. I'd love to hear if you give this a try and if you come up with any delicious variations. 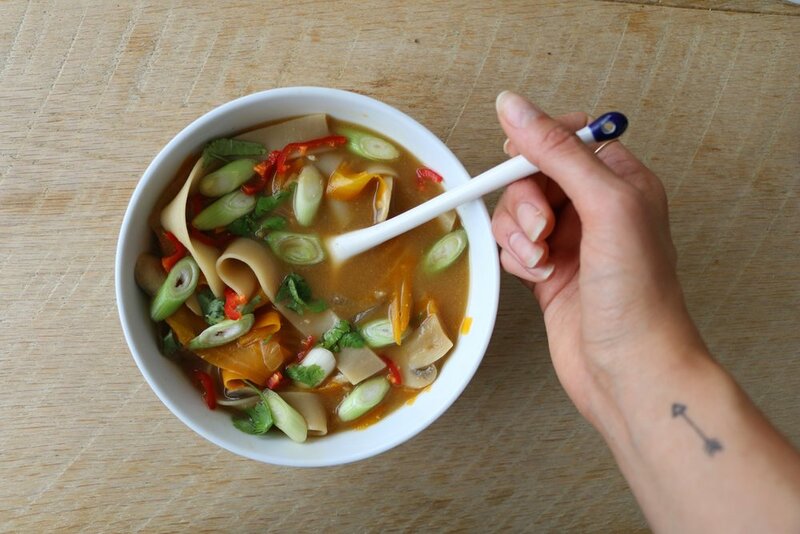 If you struggle to find noodles to use, you could always use courgetti or add extra carrot ribbons instead. 1 small thumb of ginger. Cook the noodles according to instructions, leaving them al dente. Dice the onion, then heat a glug of sesame or olive oil and lightly pan and fry the onion until soft. Cube the tofu, then add this to the pan until crispy, stirring occasionally to get all sides cooked evenly. It should take a few minutes on each side to brown and crisp. Finely chop the ginger and add this in too. In a saucepan, heat the water until boiling, add the miso paste in and sir until dissolved. Then slice the mushrooms and add them to your miso broth and leave to slowly bubble for 5-10 minutes depending on your soft you like you mushrooms. Peel the carrots, then use the peeler to make long ribbons, a bit like the noodles. Then add these in to the broth for about a minute until they soften but stay whole. Then add in the tofu, noodles and onions in the final few minutes to combine. 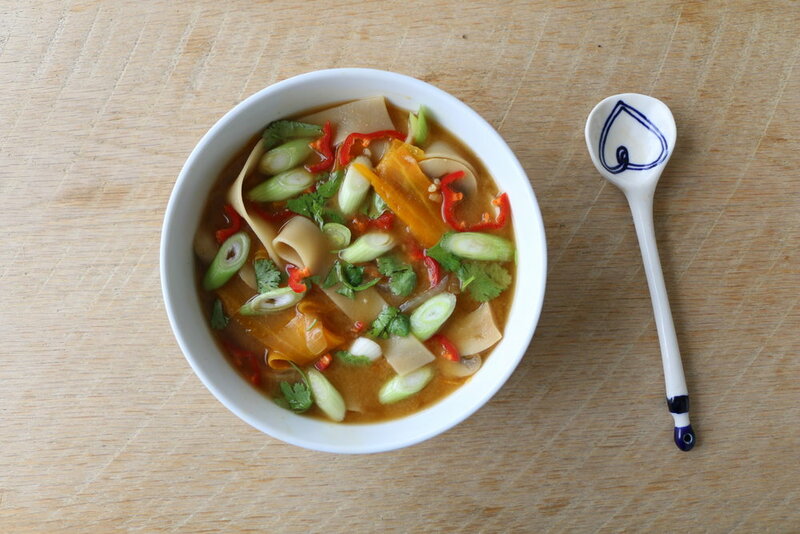 Serve with sliced chilli, coriander and spring onion.